For this first time in Commonwealth Games history, Kenya claimed a clean sweep of the medals in the women’s 10,000m.The gold medal winner was Joyce Chepkirui. The trio of Kenyans, Florence Kiplagat, Joyce Chepkirui and Emily Chebet broke away from the rest of the field with six laps left. They stayed together until there was 200m left. Then, former world cross-country and world half marathon champion Kiplagat made her move. She appeared on course for the gold but Chepkirui passed her at the last gasp to take gold in 32:09.35. 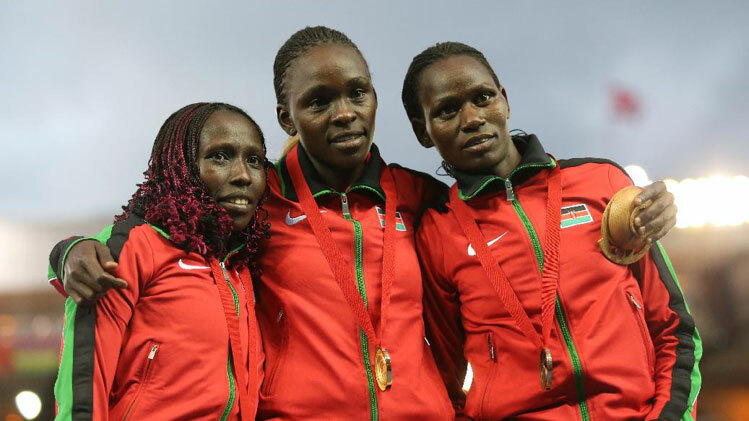 This entry was posted in Kenya Athletics News, Kenya Sports news and commentary and tagged florence kiplagat, joyce chepkirui, Kenya commonwealth games. Bookmark the permalink.